The first known inhabitants of southwest Michigan were native Americans of the Miami and Potawatomi tribes. So it's pretty safe to say that they were the first to discover the river that flows into Lake Michigan at the present day city of Saint Joseph, Michigan. The first European to "settle" at the juncture of the river and the lake was René Robert Cavelier, Sieur de La Salle. That would have been in the year 1669. La Salle and his men built Fort Miami on the shores of the river that was then called, "River Miami". In 1679 they moved on to make the first land crossing of Michigan's lower peninsula by a European, and the fort was destroyed. In 1780, William Burnett arrived in the area and built a trading post. Some years later, in 1829, Calvin Britain came to the area and drew up a plat map of the settlement which was then called Newburyport (after a town in Massachusetts). He must have been quite the salesman because lots sold quickly and the village flourished. The village of Newburyport changed it's name to St. Joseph (named for the river which was then called St. Joseph) in 1834 when it was incorporated. About that same time, the mouth of the river was changed. A new channel was dug so that it would flow directly into Lake Michigan instead of running parallel to the Lake for a distance before flowing into the lake. The north pier and it's lighthouse were built, which vies with Chicago's original lighthouse as the first on Lake Michigan. The little town grew over time. Trade and commerce flourished. Southwest Michigan was and still is prime land for growing fruit and crops. 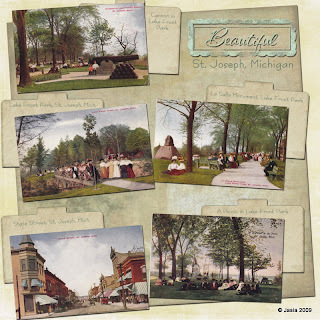 Then, in 1870, a rail line came to St. Joseph connecting it to Grand Rapids, Muskegon, Detroit, and Chicago. Shortly thereafter, in 1874, the Graham and Morton Transportation Company began running a steamship line out of St. Joseph. The shores of Lake Michigan have long been a popular destination on hot summer days, especially back before air conditioning was available. St. Joseph was especially popular after the Silver Beach Amusement Park opened in 1891. In fact, Silver Beach helped establish St. Joseph as a primary Midwest tourist attraction. The park was built along the sandy beach of Lake Michigan by Logan Drake and Louis Wallace. At first there were only a few tourist cottages and a "toboggan slide" that delivered patrons into the refreshing waters of the lake just a few feet from shore. Over time, the park was developed into a full-fledged amusement park. In 1902 a roller skating rink, dance pavilion, indoor swimming pool, and wooden boardwalk were added. A carousel was built in 1915 and a roller coaster in 1925. The original dance pavilion was replaced with the much grander Shadowland Ballroom in 1927. The ballroom was a very popular place and sounds of the Big Bands could be heard all summer long in St. Joseph. The Great Depression took it's toll on St. Joseph's tourism in the 1930s as did World War 2 in the 1940s. But the Silver Beach Amusement Park continued to grow. A number of rides, a penny arcade and bumper cars were added in the 1940s, miniature golf and more rides were added in the 1950s, and Go-Karts were added in the 1960s. By that time, however, the competition for tourism dollars grew. People had cars and no longer depended on steamships and trains to take them to vacation spots. Major amusement parks like Cedar Point, Six Flags, and Disney World lured tourists away from the smaller parks like Silver Beach. The rides became old and too expensive to maintain. With attendance down, and after an incident that destroyed the reputation of the park as a safe family place, the park closed at the end of the 1971 season. The rides were sold off and those that couldn't be sold were demolished in 1975. The Shadowland Ballroom lasted until 1981. It wasn't all just fun and games in St. Joseph though. The city was named the county seat of Berrien County in 1894. And in 1911, Louis, Emory, and Fredrick Upton started a business that produced washing machines. In 1929, the Upton Machine Company merged with Nineteen Hundred Corporation. The company began marketing a line of home appliances called "Whirlpool" in 1948, and thereafter took that as the company name. Today, Whirlpool is the world's largest manufacturer of major home appliances and still maintains a substantial presence in the area. One other noteworthy event must be mentioned in this history of St. Joseph. In 1898, Augustus Moore Herring took off from Silver Beach in his motorized glider for what some would call but others would dispute as, "the first flight". It was a very short flight, only a few seconds, really. Augustus had witnesses, but no photos were taken while he was in the air. He repeated the flight again 11 days later. Because he had no controls to direct his aircraft, however, credit for "the first flight" went to the Wright brothers and Kitty Hawk, NC some 5 years later. Today, St. Joseph has a wonderful reputation as a safe, family place. The town has a population of about 9,000 (2000 census). Silver Beach is currently being redeveloped, though not as an amusement park. The property was bought by Berrien County in 1990 and is now known as Silver Beach County Park. New beach houses and concession stands have been built. A new Shadowland Ballroom and "antique" carousel are under construction. It is expected that they will open in the summer of 2010. A fountain is expected to open this summer, 2009. The new Shadowland Ballroom is a 300-person facility for business meetings, celebrations and family get-togethers offering AV capabilities, wireless access, a catering kitchen and the option of a short walk to one of the six most beautiful beaches in the U.S. (according to “Parents” magazine). The Silver Beach Carousel will feature six horses hand carved exactly like ones on the original silver Beach Carousel, plus 42 unique horses and animals carved true to original carousel traditions and rounding boards with colorized photographs of the local community. Southwest Michigan continues to be a major grower of fruits and vegetables. It's developed a reputation as an outstanding "fruit belt" and "wine belt". And St. Joseph sits right smack dab in the middle of all that good food and drink! And the sunsets! Lake Michigan sunsets are as lovely now as they were back in the 1600s when the Miami and Potawatomi tribes lived and prospered in the area. People still come from miles around to see and photograph nature's show of brilliance. The names of the river and the town may have changed, the life of the amusement park may have ebbed and flowed, but the beauty of Lake Michigan remains timeless! Schlender, Daryl T. Silver Sands and Golden Memories, The History Of Silver Beach Amusement Park St. Joseph, Michigan . Baston Printing, Benton Harbor, MI. 2008. Anderson, Matthew G. St. Joseph. Michigan History Magazine. May/June 2004, pps. 6-13. Shultz, Alan. Silver Beach, A Scrapbook of Summers Past. Michigan History Magazine. July/August 1979. 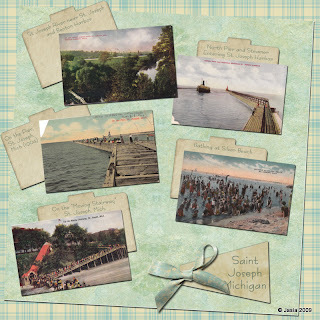 Vintage postcards of St. Joseph used in the scrapbook pages are the property of Linda Burns via her Great Great Grandmother Mary (Baird) Swigert, her Grandparents Clyde and Dorothy (Holmes) Swigert, and her Grandmother Dorothy (Swigert) Burns. My thanks and gratitude go out to Linda for kindly and generously granting me permission to use these photos here. You can view her complete collection of postcards here.